Day 2: Drive to Murchison; Travel time + 6 hours. Today you will picked from your hotel and drive to Murchison through the Luwero triangle with a stopover at Ziwa Rhino Sanctuary to track the Rhino and proceed to Masindi for an enroute lunch. After lunch we shall drive to Murchison through the Kichwambanyobo gate and check-in at the lodge for diner and overnight at Paraa Safari lodge (luxury) or Sambiya lodge (mid-range) or Parkside safari lodge(budget) on a half board meal plan. Day 3: Fishing safari along the Nile. Today after taking your early morning breakfast, you will depart with your packed lunch for the fishing adventure at 7:30 am to the River bank at ferry crossing point, where you will take a boat and head off for your full day fishing experience.The fishing is either from the rocks on the bank of the river or slightly lower downstream in the pools from a boat. Our Fishing Safaris access all fishing spots by boat from our launching point at Paraa or riverside lodge. Day 4: Game drive & boat cruise. Today you head for an early morning game drive to catch up with the morning risers and hunters such as the elephants, hartebeests, jackals, lions, leopards and more. After the game drive return to the lodge for lunch. After lunch, head for a boat cruise along the Nile to view aquatic animals and other wildlife like crocodiles, hippos, waterbucks, elephants, monitor lizards etc., and later hike to the top of the falls to have a view of the magnificent Nile as it forces itself through the narrow tunnel and later return to the lodge for dinner and overnight on a full board meal plan. Day 5: Return to Kampala; Travel time +6 hours. 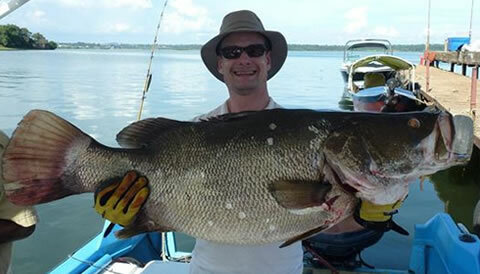 Day 6: Full day fishing Safari on Lake Victoria. Day 7: Transfer to the Airport. End of the 7 Days Fishing and Wildlife Adventure Safari in Uganda. The hot air balloon safari gives you an aerial view of Murchison Falls National Park as you spot the diversity of species wildlife. The flight is taken at a tree level so as to bring you closer so that you take a good look at the beautiful scenery of Murchison Falls National Park.